You can find gems for embedding in the Revered Tower. When you reach lv. 55, the Embed system will be unlocked in the Enhance interface. 5 slots will be opened when your equipment is enhanced to Lv. 20/40/60/80/100 respectively. If you want to open all slots as fast as possible, Crystals can be used to open these slots. When the equipment slots are opened, gems that are able to embed will appear once selecting a slot. 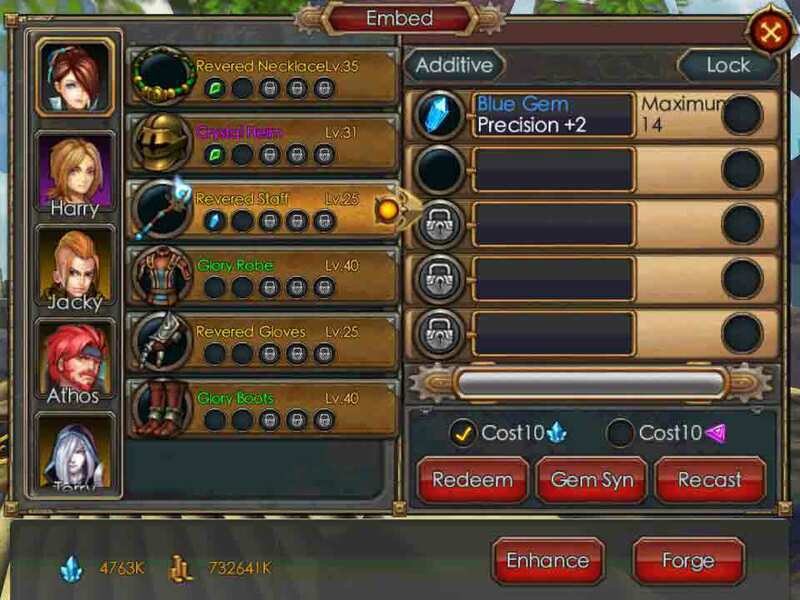 Selecting gems that you want to embed can start the embedment. After the embedment, gems’ attributes are random. You can decide if recasting a gem based on a gem’s max stats and its current random stats. Recasting consumes Crystals and Recast Stones. Gems’ attributes will be locked and the progress bar at the bottom of the gem interface will be increased after the recast (The progress bar will be reset on the second day). When the progress bar is full, using the Perfect Recast feature can boost attributes of the embedded gems. The reward chests include certain gems after stages are cleared every 5 layers. They higher the layer you clear, the better the gem quality will be. Gems are divided into 6 qualities: Green/Blue/Purple/Gold/Orange/Red. The higher the quality is, the higher the attributes will be and the more types of attributes available. So try your best to get to a higher layer. You can redeem recast stones with unwanted gems from the Redeem Recast Stone feature in the Embed interface. You can redeem gems of better qualities with unwanted gems from the Gem Synthesis feature in the Embed interface.